Mary Neal Whisenant, age 89 of Pickton, went to her heavenly home on Tuesday, September 26th, 2017 in Pickton. She was born on May 24th, 1928 in Lindsay, Ok., to Jim and Loda Bell Wilson. She was a Beauty Operator for many years as well as a Dairy Farmer, she was a member of the Tabernacle Baptist Church of Pickton. She was preceded in death by her Parents, Husbands James Courson and Bud Whisenant, Son-Michael Dwight Courson, Brothers-Eddie Wilson and Reece Wilson, Sister-Mary Jo Loyd. She is survived by, Son-Johnny Mack Courson and wife Rose of Pickton, Daughter-Brenda Gail Brown of Pickton, Brother-Thomas Wilson of Hughes Springs and Sister- Patsy Ramsey of Sulphur Springs, one Grandson-Scott Courson and wife Susan and two Great Grandchildren Camyn Courson and Emma Courson. A Graveside Service was held on Thursday, September 28th, 2017 at Como Cemetery at 10:00 am. With Bro. Mike Eason officiating. 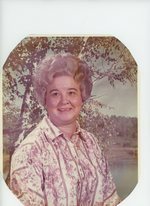 To send flowers to the family of Mary Neal Whisenant (Wilson), please visit our Heartfelt Sympathies Store.